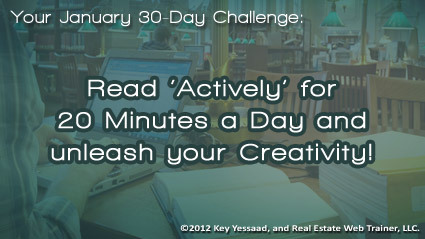 Developing and Nurturing your Inner Creativity is one of your most important business assets, and as such I’d like you to consider this 30-Day challenge for the month of January: Read Actively for 20 minutes a Day. Reading Actively is the process of sitting down at your office desk with a book, reading a few pages with a notepad or tablet next to you, and taking notes on the thoughts that are being triggered as you read. It is best that you do this early in the morning with complete silence and no distractions. The first thing you will notice when you start Actively Reading is the dislodging from your mind of activities, commitments, and of your pressing to-dos - Don’t ignore them, jot them quickly in your notepad and later on add them to your Calendar/Task List. But as you stick with this reading daily New Creative Ideas will start popping up; ideas that will help you grow your business, and it is your job to capture them; frame them within the context of your daily routine; and then act on them with intention. The kind of books you ought to consider are in the genre of Motivational and/or Business – Not novels and pleasure readings (those are good at night.) Here are some examples: The 7 Habits of Highly Effective People by Stephen R. Covey; The 21 Irrefutable Laws of Leadership by John C. Maxwell; Getting Things Done by David Allen; How to Win Friends and Influence People by Dale Carnegie; The E-Myth Revisited by Michael E. Gerber; etc. Remember the goal is not to finish the book in one sitting, but to read 4 to 5 pages daily that become nourishment to your mind – if you stick with it daily, problems will seem easier, your actions will seem more purposeful, and you will be filled with lots of energy and insights. Happy New Year!